Maria Fernanda Gonzalez is a Barquisimeto-based multi-instrumentalist and journalist. 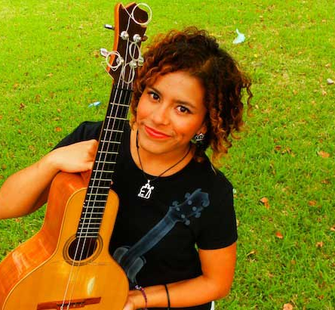 After years of studying cuatro, mandolin and violin, Maria decided to take up the bandola llanera, an obscure Venezuelan instrument with well-known few female performers. Her blazing and virtuosic performances on the bandola llanera have earned her prestigious slots on numerous festivals including Festival of Música llanera the Silbón (Venezuela), the festival Girara de Oro (Colombia), the 32nd Music Office Curitiba (Brazil), The International Jazz Festival Barquisimeto (Venezuela) and Folklorico Summer Festivals (Portugal and Spain). She currently teaches master classes on the bandola llanera and is working on codifying and writing a new universal teaching method for the instrument. Through performance and education, Maria hopes to help the bandola llanera achieve worldwide recognition, "on the scale of the venezuelan cuatro and the joropo llanero."